Now I know I said I wasn't going to make any resolutions this year, but I'm a loser, I'm sorry. I backed out. I have one. This year, my New Year's Resolution is just to make thing work. Anyone who knows me in real life may know that I didn't end last year on the greatest footing, and I let that hold me back. This year, I've decided that it doesn't matter where I am or what I'm doing, and all that's important is remembering that I'm in a much better position now than I was just a few months ago. For instance, last year I really wanted to get back in to running but an unexpected house move meant that there wasn't anywhere really for me to go. I couldn't get to a gym, and the roads near my house were too dangerous to venture out on, meaning my running trips were limited to when I was at Sam's. Today I decided to do something about it, and ran the only place that was available to me-- a boggy, muddy, slippery, cramped woodland trail. 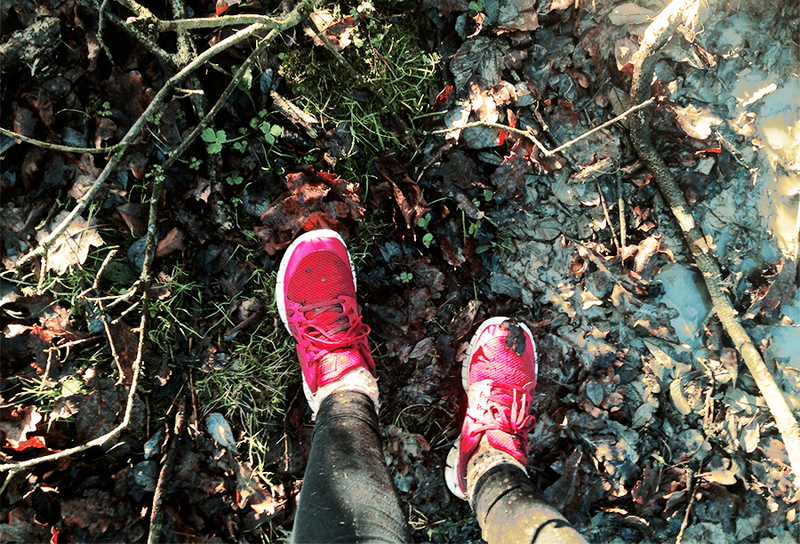 I spent most of my run ducking under trees and manoeuvring around huge mud slides and streams. My socks and shoes were saturated within about two minutes, but it was by far the best run I've had so far. I got to keep to my goals and also spend a morning in the Great British countryside. Now I just hope my shoes dry in time for tomorrow (they're too muddy to go on the radiator).